SFCC Governing Board recently installed new member George Gamble, Ph.D. Dr. Gamble Retired from the University of North Carolina at Chapel Hill. These are the newly elected officers: Linda Siegle, Chair; Jack Sullivan, Vice Chair; and George Gamble, Ph.D., Secretary; Kathy Keith and Martha Romero, Ph.D., members. 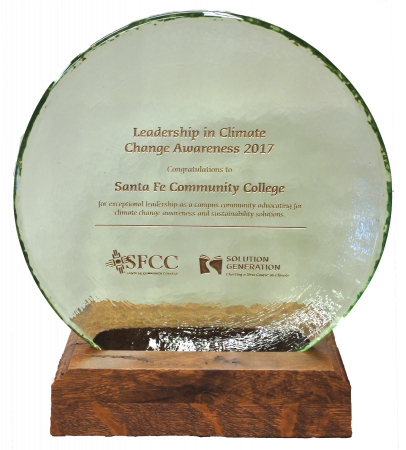 SFCC thanks past Governing Board Member Pablo Sedillo for his years of service to and support of the college. 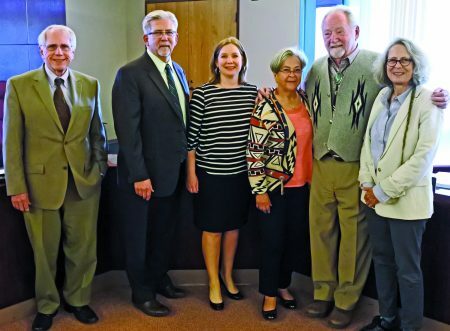 Former SFCC Governing Board Chair Kathy Keith and members of the College’s Training Center Corporation recently welcomed Dr. Imre Gyuk to campus. Dr. Gyuk is the Energy Storage Systems Program Manager at the U.S. Department of Energy Office of Electricity Delivery and Energy Reliability. Dr. Gyuk spoke with professionals from diverse energy sectors and explored such topics as the kind of energy storage that might work in Santa Fe, how energy storage can reduce costs at peak times, emerging technologies, workforce training, and more. “For every dollar that we are not spending on energy we can spend on our students,” said Keith. Executive Director for Plant Operations Management Henry Mignardot, along with faculty and staff Stephen Gomez, Ph.D., Ondine Frauenglass, Luke Spangenburg and Xubi Wilson facilitated the conversation and provided a tour of the Trades and Advanced Technology Center. Two initiatives honored fitness instructor Gerald Clay, who passed away last August. He taught at SFCC for more than 22 years. He believed in each student’s potential and he inspired them to believe in themselves. 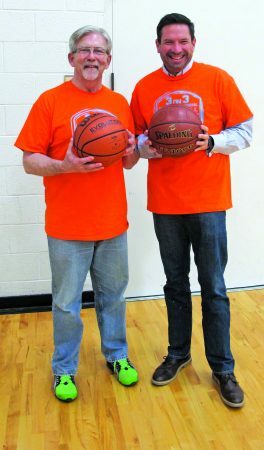 The Gerald Clay Memorial Basketball Tournament raised nearly $5,000 to support maintenance and equipment for the William C. Witter Fitness Education Center. Santa Fe Mayor Javier Gonzales joined SFCC President Randy Grissom to cheer on teams and participate in the free-throw competition. Students, faculty and staff members, and local sponsors helped make the tournament a success. The SFCC Foundation established the Gerald Clay Memorial Endowed Scholarship. Nancy Witter, widow of SFCC President William C. Witter, has raised $3,500 toward the goal of $10,000, and she’s committed to seeing that goal met. To donate to the Gerald Clay Scholarship, contact Kelly Smith, Foundation Database and Fund Development Manager, at 505- 428-1175 or kelly.smith@sfcc.edu. East Wing Eatery Sous Chef and alumnus Kyle Pacheco (Santo Domingo) won the First Place Gold award in Culinary. Student Frank Trujillo won First Place in the Welding Sculpting, and student Michelle Harding took Third Place in Commercial Baking. Pacheco and Trujillo will compete in the SkillsUSA Championships at the National Leadership and Skills Conference in Louisville, KY. The LANL Foundation has awarded $1,000 Regional College and Returning Student Scholarships from the Los Alamos Employees’ Scholarship Fund to help local nontraditional students return to formal education to expand job opportunities or pursue new careers. The SFCC recipients are Craig Charlton (biology and health sciences); Lydia Clark (film); and Jinelle Scully (nursing). Los Alamos National Laboratory employees, Los Alamos National Security LLC and community members provided funding. An immigrant from Bulgaria who was a recognized artist in his country and abroad, Ivan arrived in the U.S. with little more than a dream of a better life. As people started to recognize his talents, demand for his work began to spread. “I’m grateful for the support that I’ve received,” he said with a grin. 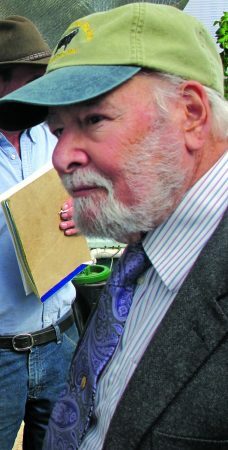 Since arriving in Santa Fe 20 years ago, he has worked on carvings for La Fonda, the Hilton, churches in several states, and homes in Las Campanas. While Ivan enjoys carving professionally, he also loves sharing his skills with his students. “This work takes tremendous patience and I’m proud of my students and their work,” he said. 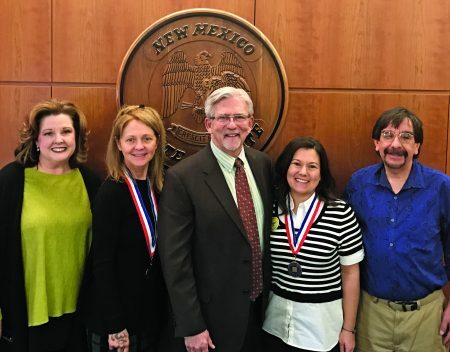 Left to right: Vice President for Academic and Student Affairs Margaret Peters, Academic All-Star Susan Griego O’Connor, President Randy Grissom, Academic All-Star Jinelle Scully, Associate Professor and Phi Theta Kappa adviser Andrew Lovato, Ph.D.
SFCC students Susan Griego O’Connor and Jinelle Scully were named to the New Mexico All-Stars Academic Team, sponsored by Phi Theta Kappa and the New Mexico Independent Community College Association.